Interested in Art Deco design? 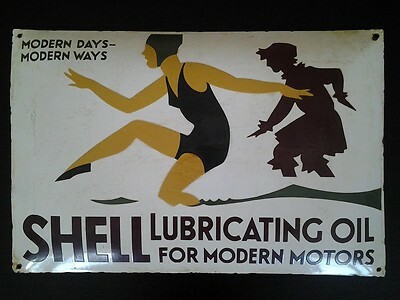 This Shell Lubricating Oil For Modern Motos Art Deco porcelain sign is what you are looking for. In the foreground is a female dressed in a one-piece swimsuit facing left. She has her right leg extended, along with her right arm. At her feet are waves in a very abstracted form. Behind the woman, who has no details show, is a shadow of a man. The illustration looks similar to the cartoon of Peter Pan chasing his shadow on the wall. To the bottom, the text reads “Shell Lubricating Oil, For Modern Motors.” At the top of the sign is a small touch of text that says “Modern Days – Modern Ways.” The sign measures 23″ by 15″.